The Environment of Play ebook is full of inspiring colour images of playgrounds around the world, this book is ideal for designers, park managers, schools and parents! Play is the most important and effective method of learning for adults as well as children. It can be active or passive, planned or spontaneous. 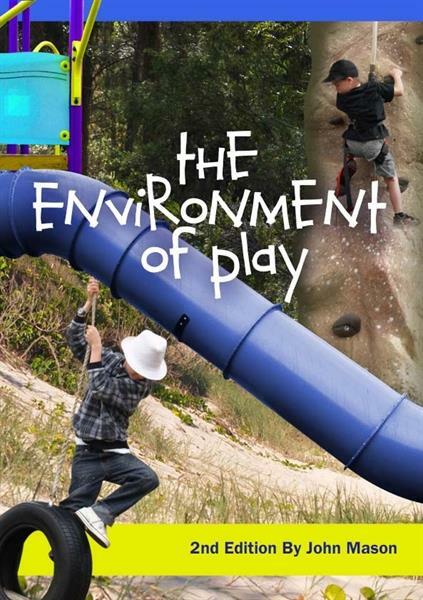 If you want to learn about the relationship between PLAY and the ENVIRONMENT, this is the ebook for you. Learn to understand children and design play spaces that function, for homes, parks or school grounds. 1. Our biological/chemical (or genetic) make-up. 2. Our surroundings or ENVIRONMENT. This book is about relationships between PLAY and the ENVIRONMENT. First published in the USA in 1982. Used in the past as a university text (in landscaping and education degrees). Completely revised in 2012. This refers to how people perceive the playground in its appearance. Does it look neat, colourful, obscure, gaudy, natural, attractive or repulsive? It is important to realise that different people have different aesthetic perceptions. Children often disagree with adults in their aesthetic preferences. Children tend to be attracted to a messy appearance and to bright colours whereas adults are very often repulsed by these same things. This leads to a conflict. The children are the ones using the playground so it can be argued that the playground should reflect their aesthetic preferences. On the other hand, the playground often borders on the adult world and there is no escaping the imposition of the aesthetics to the outside. The adults must have some rights too. Often adults use their power over children too much, and over-impose their aesthetic standards on the children. + Unity - this is achieved by grouping or arranging in such a way that individual components have a sense of oneness. + Balance - this refers to symmetrical or asymmetrical balance. + Proportion - this refers to sizing or scaling of components in relation to each other and to the total landscape. + Harmony - this refers to the way all of the parts of the design fit together. + Contrast - this is the opposite of harmony and should not be overdone. Occasional contrast adds interest and creates a more alive atmosphere. Achieving appropriate aesthetic effects will create an atmosphere which will encourage certain types of activity and discourage others. In this way, aesthetics has a definite relationship with function. There can often be conflict between what is socially acceptable and what is functional. It might be functional for children to build cubby houses in a playground, but not socially accepted in that community. It might be functional to pay for a playground development by billboard advertising, but it might not be socially accepted. 1) Initial Costs - cost of design and construction. 2) Ongoing Costs - cost of maintenance and perhaps employment of play leaders (or supervisors, etc). These criteria (and others) should be considered relative to the components or elements of the design. The resulting arrangement becomes your playground design. + Close mowing tends to make an area seem larger. + A smooth boundary will make an area seem larger. + Shadows or openings at one side of an area will make it seem wider. + Looking downhill makes a distance seem longer. + Looking uphill makes a distance seem shorter. + Too much repetition and harmony is monotonous. + Too much contrast is chaotic. + Spaces which are too small can be oppressive. + Large spaces are empty and hollow unless there are a large number of people in those spaces. + Long spaces (in large scale public landscapes) can be overdone, becoming psychologically exhausting. + To achieve a harmony in space in enclosed areas - the ratio of building height to space width should be no more than 1 :4. + Introduced landforms i.e. reshaping of land, should blend in with existing topography. + Coarse textures decrease the apparent size of spaces. + Fine textures will make small spaces look bigger. + Flowing curved lines are passive, soft and pleasant. + Geometric lines and shapes are solid, strong and formal. + Sharp, straight, irregular lines create an active, vigorous feeling in a garden. + A garden can be made to appear larger by making trees and other features from adjoining properties appear to be part of the garden itself. Like this ebook? You might also be interested in our online courses.